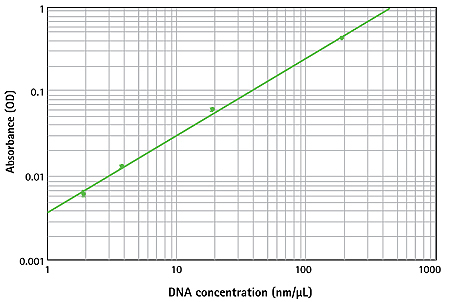 Catalyze your research with smaller, faster, quantification of DNA, RNA, and protein. The SpectraDrop™ Micro-Volume Microplate handles volumes down to 2 µL and integrates seamlessly with the StakMax Microplate Stacker, enabling you to acquire more data, from smaller samples, in less time. 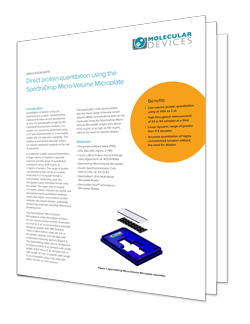 Learn how the SpectraDrop Micro-Volume Microplate can help you quantitate protein samples as low as 2μL. Click here to download the application note. The SpectraDrop Micro-Volume Microplate consists of specially designed adapter, Teflon-coated bottom slide, and top slide with evaporation reducing spacers. For simplicity of use, the slide design is compatible with 8- and/or 16-channel pipettors. 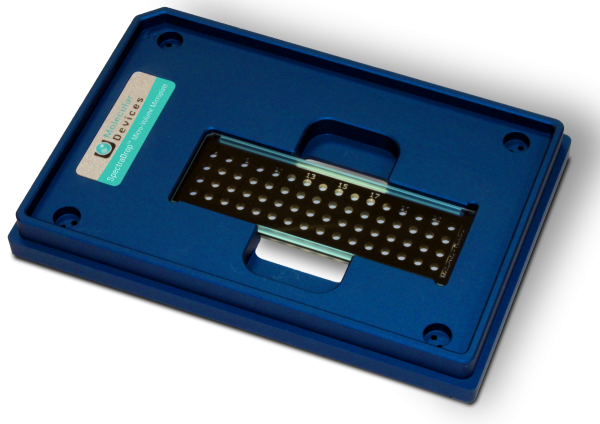 SpectraDrop Micro-Volume Microplates are supported by SoftMax® Pro Microplate Data Acquisition and Analysis Software which offers ready-to-read protocols.